ALERT: WMATA proposal to eliminate D3 bus – your testimony needed! Recent news coverage has failed to point out that WMATA is proposing elimination of the D3 bus line as a part of its latest restructuring, and little time remains to voice your concerns about this proposal. 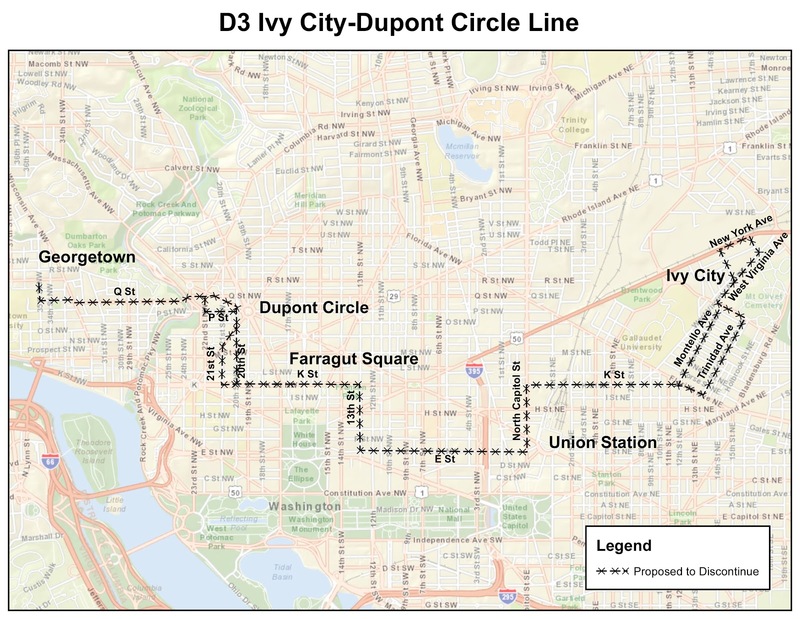 The D3 currently provides a direct connection from Ivy City, through Trinidad, to downtown, Dupont Circle, and Georgetown. It provides a convenient way to access Metrorail’s Green and Yellow lines, by disembarking at 7th and E Streets NW. Metro’s rationale for eliminating the D3 is “duplication with other routes” and “low productivity.” We haven’t found anything quantifying “productivity” on WMATA’s website, so we don’t quite know how it is defined. Perhaps one thing causing “low productivity” would be a low farebox recovery rate on the line. A number of riders in the neighborhood have noted that the fareboxes on the buses are not frequently working – it means a free ride, but that clearly hurts the system financially in the long run. Additionally, we’d guess those free rides aren’t counted in the overall ridership totals for the line. Other bus routes certainly run through Trinidad, but nothing provides a direct connection from our neighborhood to the other side of the central business district in the morning. WMATA does not clearly state whether they will increase bus frequency on the other lines that run on Montello and Trinidad Avenues (D4 and D8) to make up for the lost capacity. Speaking of the D4, it will be changing as well. 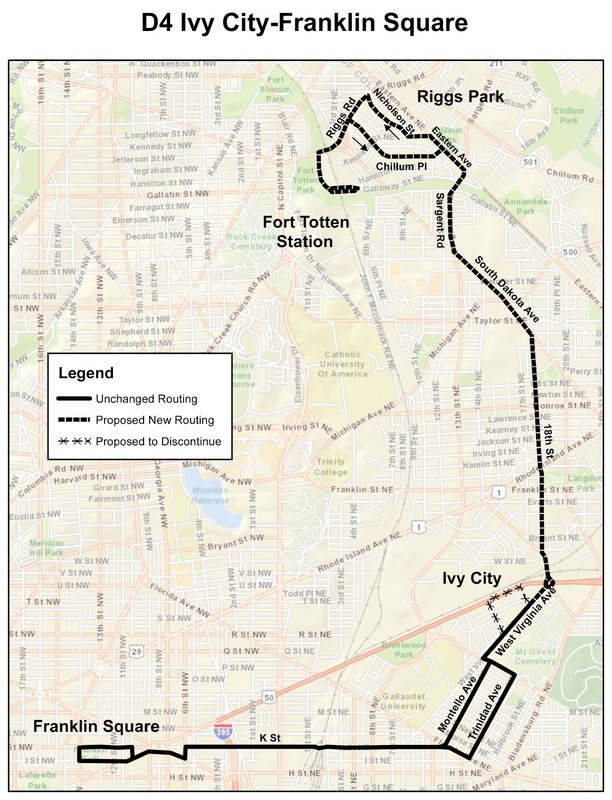 The D4 route, which currently runs between Ivy City and Franklin Square, will more than double in length when it’s extended north from Ivy City to the Fort Totten Metro Station. It will be taking over the easternmost part of the E2, E3, and E4 lines, which currently run from from Friendship Heights through Fort Totten to Ivy City. Longer routes can lead to more opportunities for buses to fall off schedule, as well as “bunching,” which is when many buses on one route arrive at a stop at once. This can lead to very long waits between buses instead of the expected even spacing. Metro originally announced a hearing for the changes happening in Northeast DC for October 30, but the impact of Hurricane Sandy meant that it was rescheduled to November 26, the Monday that just passed. A heading says “Routes seeing improvements in this bus service change proposal” on the page with the public hearing schedule, but the list does not mention the elimination of the D3. Certainly, one could argue that the elimination of a route is not an improvement, so WMATA was under no obligation to list the removal of the route on that list. We would argue the total elimination of a route is something that should be prominently noted, regardless of whether this is an “improvement” or not. An additional problem is that we have seen no signs at the bus stops along the route alerting people to these changes. Certainly people who ride the D3 would be interested to know their bus is going away, and wouldn’t the best place to reach those people be on the bus itself? [From what we understand, the date for submissions was changed due to the hurricane as well, though the original press release does not indicate that.]. Please note that any personal information such as name, e-mail address, address, or telephone number you provide in the statement may be releasable to the public under the WMATA Public Access to Records Policy, available at http://www.wmata.com/about_metro/public_rr.cfm. Let WMATA know what you think about the changes to the D3, D4, or any other route that they plan to change in the new year. Posted on November 30, 2012, in Public Hearings and tagged WMATA. Bookmark the permalink. 1 Comment.